● Save as much as 37% off the regular price of items featured on the Inventory Clearance page. ● Shipping fees depend on the volume, weight and destination of the orders. The cost is automatically calculated upon checkout. ● Returns and exchanges are allowed up to 30 days after the receipt of the items. ● Save as much as $300 on selected items or take advantage of free shipping offers when you use online coupons. A clearinghouse of sorts for industrial equipment, storage options, furniture, and commercial technology, Global Industrial provides businesses and organizations with the opportunity to purchase the equipment and storage solutions that they need at deeply discounted prices. Many of their merchandise options are available with free shipping, though special expedited orders are going to have to pay a little bit more to have their merchandise delivered to their doorstep. Customers can save even more when shopping on the Global Industrial website by ordering in bulk, and industrial customers will be able to save even more money on shipping when they order multiple pieces at a time. 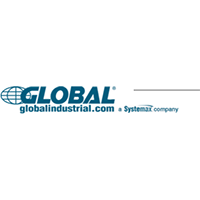 For most up to date offers check out Global Industrial on Facebook and Twitter or contact Global Industrial Support for any questions.